For most people, the atomic bomb and the hydrogen bomb are pretty much the same thing with the only difference being their relative strengths. While this is partly true–with the hydrogen bomb being considerably more powerful–both types of bombs actually have a number of differences with each other, most having to do with their construction and means of detonation. Let's take a look at their other differences and similarities. The process that is at the heart of every atomic bomb explosion is called nuclear fission, which utilizes a certain amount of uranium 235 or plutonium 239. Nuclear fission essentially involves splitting the atoms of either of those two radioactive elements. 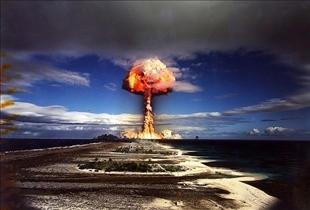 Atomic bombs are typically set off by an explosion from a TNT-equipped device. This causes the radioactive matter to become packed tightly together, causing the individual atoms to collide with each other with explosive force. This sets off a chain reaction with more and more atoms breaking down and releasing energy, resulting in a nuclear explosion. The hydrogen bomb on the other hand is set off not by an explosive charge but an actual atomic bomb. The elements that form hydrogen–deuterium and tritium–are packed tightly together in a manner similar to that of the atoms in a nuclear fission reaction in an atomic bomb, causing a nuclear fusion. This produces a considerably stronger explosion. The entire nuclear fission process happens in a matter of a split-second, although the results can be pretty devastating. 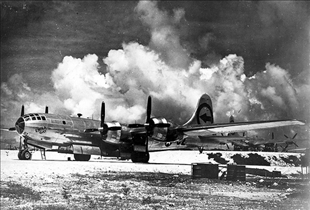 Anyone who has seen pictures and film footage of the bombing of Hiroshima and Nagasaki in Japan during the last days of World War II are well aware of the atomic bomb destructive force. More powerful still is the hydrogen bomb, which is estimated to produce the explosive force of several millions of tons of TNT. These types of bobs have also been designed to expel more radioactive material into the air above the drop site. The results, as you can imagine, can be pretty destructive. Which weapons of mass destruction world does not need? Nonviolence is the greatest force at the disposal of mankind. It is mightier than the mightiest weapon of destruction devised by the ingenuity of man, Mahatma Gandhi. Peace without war is hard and takes many years of even harder work, peace will never come in a day but several generations of building trust with one and other. If we (the world) continue to eradicate any one who disagrees with our way of life than in the end there will be no one left. I admire your childish naivete. People like Gandhi who tried that approach vs. the **** died in Auschwitz and Dachau. People who tried it against Stalin died in the Gulags. Mao's descendents are still killing the Falun Gong folks. Sometimes it works against nations led by Christian people; but never against Muslims or Communists. Sometimes you have to kill the wolf to save the sheep. The Holocaust is a lie! Are you that dumb?, my grandfather was on the ground fighting in WWII and I can assure you that it was all to real. One of the most horrific deeds ever done by man. The soldiers could not even believe it, until the camps were discovered. totally agree Mike. and the Muslims will NEVER, NEVER stop until they HOPE to kill every Jew.And for that matter, EVERY SINGLE INFIDEL as well. Heck, they have no problem killing even their own children for no reason! and all because they think there are 72 virgins waiting for them? man, where on earth, or the universe, are they going to find that many virgins???????????????????????? I wish people would/could understand that there will never be a day of non-war existance. War has been going on since very near the beginning of time. What we need to learn are two things instead of trying to vie for the impossible. 1 - when one goes to war, recognize that one side will throw all they have at the other and the to beat that side is to throw more of what you have at them. That will end the war in much less time, with much less devastation and with much less loss of life. 2 - Usually, and I mean usually, the people we are at war with fight in a manner in which they have no rules. Therfore, although we should nt follow suit with that way of thinking, we should not tolerate it to any degree. In other words, if they break the rules, have no mercy on them. With that said, if anyone can honestly believe for a moment there will be a day of total peace and an environment where there will never be war, you just don't know the history of this wrld and of mankind. Even in the science fiction books of utopia, there are stil wars. The human brain is not one that is exactly like the other. There will always be those that destroy and always be those that love. And the in between levels are so great it is simply impossible to mathmatically solve that equation. That is the best comment I have heard. Thats a very ignorant statement. Its saying we have always had war so get used to it. Ignorance personified. Humans used to eat each other should we get used to that too? Humans enslaved each other should we accept that as right because its in our history? You know nothing about the truth of reality and your opinions are very low on the intelligence scale. I got a suggestion,... Get your head out of your ****! you just proved him right, no two human brains are alike; so there will always be sides....NOW GET UR HEAD OUT OF UR ****!!! or maybe ur just jealous or scared of some1 who thinks different than you. is that not why humans fight and country's go to war? If you want to live as a naiive simpleton.....go for it. Just don't make everyone else think that you have a valid point......you have a wish....nothing wrong with a wish; but solving life-or-death problems allows no space for dreamy wishes. There is no time to re-educate people into the fantasy-island aspect of humanity. Humanity is life-and-death, moment-to-moment actions which shape the very world in which we exist. Your utopian wish is a fine subject for a week's worth of community college philosophy 101 for 18 and 19 yr olds to contemplate; but stop trying to inject this childish rejection of real world situations by simply trying to smooth it over with the euphemism of "peace now" and "why don't we try to love each other" as a solution to threats by the lies of people like Kim Jung Un, who relates to hydrogen bombs like 7th graders relate to video games......get a grip, and function in the real world....it's not as comfy as dreams and wishes.....but you might actually contribute to a solution. eeeeeh. Everybody preaches peace when they really dont understand that peace somthing almost impossible in the world we live in. Yeh, its possible (1 in a million) but there are so many conflicting ideas in the world for everyone to get along. But if you mean general peace,like non violence,the same appllies becasue there will always be radical beliefs. In most cases in the world, WWI WWII, peace was tried first, but your can only be rational for so long. sometimes.... well, in most cases war leads to peace.. so it would be a double standard since you cant have one without the other. war was fought for countries to be free. war was fought for people to be safe. aqnd unless we live in a utopia where people dont feel natural emotions like aggitation and aggression... international peace is only a dream. Nah. Not the only way. You really have to be making fun of those of us from "Realville", or you are getting paid by the "Down with America" cult. You have just reiterated what policies have totally failed for the cause of America for over 35 years, for what "peaceniks" have refused to own up to: that their irresponsible, childish position is nowhere close to reality, nowhere close to identifying the real evil which lies in wait for people like you to become policymakers instead of off-the-wall, pie-in-the-sky dreamy fantasizers who never get the memo that there are many millions of people who want to destroy America........just to watch us die. There will never be peace on Earth, it is not possible for man to agree with you and listen. That statment will never be untill God and Jesus comes out of the clouds and all evil will be sent into the Lake of Fire and the rightous will go into New Paradise. If you do believe in God and are a christian. I hope you will understand this statement and agree. But surely you must agree that Jesus said, "Blessed are the peacemakers, for they shall inherit the earth." Turning the other cheek is a commitment to checking the personal and national ego at the door and seeking harmony where possible, maybe even generating it if human hearts are open to the Spirit. But we must, of course, remember to never let the Hitlers and Stalins of the world use negotiation and "peace talks" to lower our defenses. The kids depend on us to stay alert on the tower. In that I agree human nature will never be what it needs to be in order to "secure lasting peace," something these international negotiation jokers cannot admit. That doesn't mean we shouldn't try for peace. I don't think God is against peace. To say we shouldn't work for peace is ludicrous. Peace is something we can barely achieve for ourselves, on a micro level. How can we expect it as a collective whole? But this fixation on peace means we are robotic adherents to some overlord mentality where peace is like a lobotomy. Etherized upon the table, we finally give up warring. The goal is not some slogan of peace, but expression of humanity. We may be the last of us. What would we want the universe to know is humanity? Struggle, pain, hardship and grief are part of existence as is love, joy and simply realizing you are not the center of the universe. Instead of bemoaning what isn't, try identifying a birdsong or learn why quantum physics says the human brain is the most powerful machine on the planet. We're going to die. But while you're alive, seek some wonder, mystery, joy. Appreciate some beauty. Feel something. Give something. Take care of your precious human life. We cannot hope that "god" will come and get rid of all evil we need to do it ourselves. One person can change the world. For the better or worse. We just need to make that choice… better or worse. I believe that world peace could be achieved in time and hard work alot of both. Gee (derived from Jesus, BTW), I'm not Christian, so I will go to h--- Joseph? It's people who think like you that cause wars. Notice I have no grammatical or spelling errors, then read what you wrote. Education leads to peace. Try it. Until, not until. God and Jesus come. They don't comes. And good people will be in heaven. Not just Christians. Thinking like you think causes wars. Oops, typo: until, not untill. As unfortunate as it will seem to some people Mike is 100% correct. Just for example, a farmer (sheep or whichever animal) does not attempt to tame the wolves and have new pets. The farmer shoots them, traps them or maybe poisons them. If let alive the wolf will strike at our least protected side and at the worst possible time. Example: December 7th, 1941. I also saw those mistakes, Blazer. The grammatical wanna-be "geniuses" are most often the first to make an error. Religion is man made not God made. Therefore you are correct. WWI WWII, Korean war, Vietnam war, Iraq war, Afghanistan war...none of these were caused by religion. And these killed far more people than any so called "religious" war. Also these so called religious wars were in fact not really about religion...that was just a pious cloak for territory/loot/power and very little to do with any real religious matters. Grammatical and spelling errors mean you have a lack of imagination. Those ears aren't deaf, Buddy. They're imaginary. Two have been used since they were invented. And "Mutuially-Assured Destruction" kept the USA and USSR peaceful during the Cold War. The first nation to launch an atomic attack on another will cease to exist before the next sun rises. The world cannot not wait to negotiate a response. The response will have to be immediate, massive and atomic. It's the only way to be sure of preventing a quick follow up. Then there'll be peace without atomic weapons, for the same reason an alcoholic has to bottom out before reaching recovery... his nemesis has become too ugly to bear. Sorry. You must mean the second nation. We were already the first. And Mutually-Assured Destruction only works if your opponent is sane. Some of the nations who now possess "nukes" may not be in that category. Many of those seeking "nukes" are definitely not. Trying to view the film, but all I see is a message that says 'this video does not exist'! I would just like to make a simple comment.... There was an awful lot of killing, threats and warmongering in the bible. All of it was about religion, race or inter-tribal disputes. Almost all were justified by some kind of divine instruction to 'destroy those who oppose the ways of the Lord' or similar excuse. ...so people were asked to kill each other by God?!? For a God who loved peace, he stirred up a lot of hatred - in his name! The moment the soul of the world's second man was formed, they were mutually assured destruction. Please enlighten us to the truth.